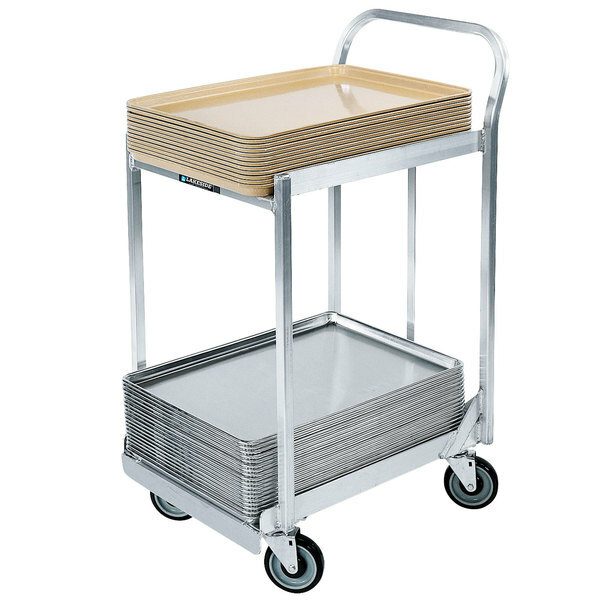 Easily transport and store your business's sheet pans with this Lakeside 633 aluminum two tier sheet pan dolly with sides, handle, and 5" casters. Designed to accommodate sheet pans and trays measuring 18" x 26", 14" x 18", and 13" x 18", this dolly is a versatile addition to your restaurant, catering business, hotel, bakery, and more. Ensure your trays remain stationary with this dolly's elevated frame and side supports. Additionally, you can transport two different types of pans and/or trays with the dolly's two separate shelves. Made of dependable aluminum, this dolly is rust-proof and corrosion-resistant, ensuring a long product life. Thanks to its all welded construction, this quality dolly provides optimal stability. 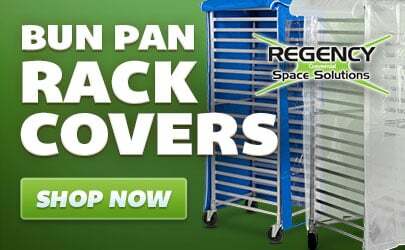 Featuring (4) 5" swivel casters, this dolly makes movement of heavy pans a breeze! Plus, you can easily move and control the dolly with its integrated handle. Add this dolly to your business for added efficiency and minimized labor!